At the risk of sounding like a broken record, I have to start this blog post by repeating myself again! I am loving Ghana very much these days. I have never visited the place, but the more I read about it, the more I realize that I have to visit very soon indeed. Here we are again to discuss another great book from a Ghanaian author and, this time, the author is not in the diaspora but very much in Ghana. “I speak of Ghana” was a very short and powerful read . Before I started making my observations on the various themes on this book, allow me to say a word about the author. He is the author of two non-fiction books: Through the Gates of Thought (2010) and Excursions in my Mind (2008) and one fiction book (a collection of short stories), Tales from Different Tails (2011). He keeps a personal blog at www.nanadamoah.com, is the creator and editor of StoryLoom and Ghanamanisms (www.storyloom.wordpress.com and www.ghanamanisms.wordpress.com dedicated to Ghanaian fiction and non-fiction respectively) and is a columnist of Business and Financial Times newspaper. It’s a rare person who can be both funny and wise at the same time. Yet that is exactly the way to describe Nana Awere Damoah’s writings in this small but compelling short story collection about contemporary life in Ghana. In it the reader will find Ghanaman in traffic, or Ghanawoman paying the corrupt policeman. Either way, one knows these are the words of a master story-teller who handily blurs the lines between laughing so hard it makes one cry, or crying so hard it makes one laugh.I Speak of Ghana is an honest journey of deft oration replete with the sounds (from the harmonious to the cacophonic), smells (including the pleasant and unpleasant), sights (from the eye-catching to the embarrassing), frustrations, triumphs and the mundane – everything that makes the Ghanaian experience finds its way into this book. 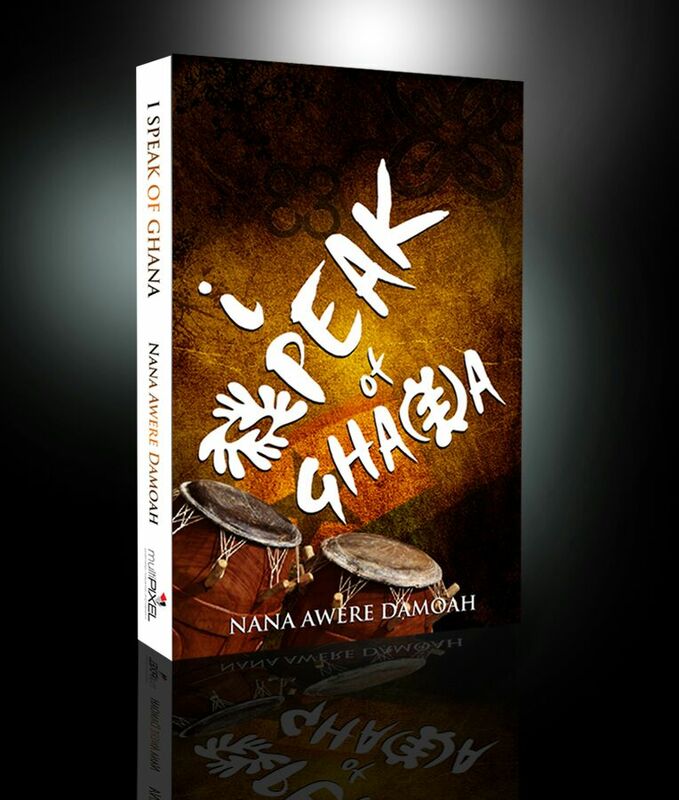 Unlike the typical ranting about Ghanaian situations, Nana performs an insightful examination of the heart of the matter. Dissimilar to empty praise, Nana thoroughly embraces the issues that give us hope as people connected to Ghana. Narrated with humor, the book is Nana’s eloquence at its best. The first thing I noticed, after reading 14 pages, was how very close to my reality the observations, made about Ghana, was. I am from Senegal, it is still in west Africa, but in my mind the two countries couldn’t be more different. Apart from the French-English divide, I somehow thought that we were very much different as a people. But what “I speak of Ghana” did to me, was to make me rethink that whole paradigm. Are we really that different? At this point of the argument, someone could legitimately asked: what differences are we talking about exactly? Indeed, what differences? Allow me then to be more specific. You know you are in Ghana (Senegal) when street lights are visible decorations by day and invisible shadows by night. You know you are in Ghana (Senegal) when ambulances carry dead people leisurely from the hospitals whilst taxis carry sick people hurriedly to the hospitals. You know you are in Ghana (Senegal) when a politician pays you to get him into office only for you to pay him when he gets out of office. I am found myself nodding and laughing continuously while reading this book, which is a good think. It only means that the Pan-Africanism dream is not that elusive. It is still possible since we share so many similarities. However, I must also point out that, as the title suggested very well, there were a lot of Ghanamanism (Wait-o, is that a world?) in the book. I was very excited to be introduced to the day-to-day of the “middle-class” people of Ghana and experience some of the beautiful scenery. I really need to visit! One thing I didn’t expect was the genre of the book. Before reading it, I used to think that it was a work of fiction. Actually, it’s not! It is quite closer to the non-fiction genre. But then again, it’s not your standard argument supported by solid evidence type of book. Nana called this genre: the creative non-fiction. And you now what I love it very much and I am sure you will too. Pan-Africanism: I used to be a fervent believer of this notion. Regardless of their respective identities and origins, all Africans should come together and build the continent. A common ground (culture, language…) must be found as the basis for such a project. Really, I used to strongly believe in it. Fast forward 2013, I still believe in it. I really do! It’s just that, now, I am more aware of the enormous challenges we must overcome before reaching that goal. Which bring me to the chapter untitled “The Future Started Yesterday and We are Already Late“. But wait-o, if schools, such as the one Nana attended, teach to their students all the things he mentioned in his chapter #2 “Pro Patria, for the Sake of Africa!”, then I believe we stand a chance. Unfortunately, in my school they didn’t teach us the same thing. Maybe, if we want to build a united Africa that is where we should start.In School! World toilet day: This chapter is one of the funniest in the book, just thinking about it make me laugh like crazy. But on a more serious note, Nana has ,indeed, highlighted a very important issue here. Not everyone have access to a toilet in Ghana (read also Senegal and I am sure your country!). It is very hard to believe,after all, we are in 2013! I believe the UN and all the NGOS working within this specific sector, did and are still doing a great job about this issue. Sometimes, rather than debate endlessly about the big universal questions such as: should NGOs come to Africa and help us? should we “take” or “beg” for aid? We should focus on more practical matters. While we are busy thinking and/or bickering, some people are living without a toilet. And… We are effectively dropping the ball. Critical Thinking: “Don’t believe, whatever they say”. Please use your judgment or, as Nana would say use the coconut which sits atop your neck. I used to think that people from Senegal were very credule and gullible. But apparently, we are not the only ones. In this era of over-information, using whatever you read or hear wisely has never been more important. Brown Leaves Fall, Green Leaves Fall Too : “When an old man dies, it’s a library that burns to the ground”, I am sure you have heard this quote several times. Everytime I read it, I want to say: “what happen to passing the knowledge to the younger generation before leaving?” This issue, here, is very close to my heart. It is a huge frustration for me. When you are young and living in Africa, no one takes you seriously. If you are a girl, young, unmarried, you don’t even exist! No one will ever ask you your opinion about important matters. If you don’t believe me, try doing business, or better still ,apply for certain jobs, you will notice some very interesting things about your own country. I am so glad, Nana talks about, how he encourages his children to voice their opinion even though they are quite young. Honestly, I have plenty of things to say about all of the chapters in this book. This book makes you think about certain issues with a new perspective. So the best thing is to read it and see for yourself where you stand on the various issues. It doesn’t hurt that it is very hilarious. Good writing does not succeed or fail on the strength of its ability to persuade. It succeeds or fails on the strength of its ability to engage you, to make you think, to give you a glimpse into someone elses head. Good writing does not succeed or fail on the strength of its ability to persuade. It succeeds or fails on the strength of its ability to engage you, to make you think, to give you a glimpse into someone else’s head. Excellent review, Ndeye. I have a copy waiting to be read. I must get to it soonest! I’m going to Goodreads right away to add this to my to-read list! Thank you for such a great, in-depth review. The books I’ve been reading so far were mainly about Eastern and Central Africa, so it will exciting to venture into the new for me Western African territory. Your blog as a whole seems like a great resource for reading ideas. I’m glad I found it! Keep it up, Ndeye. Thank you Jules and for connecting on Goodreads too. This is a great review. I have an autographed copy of the book I bought at the launch. It certainly was a great read.